« Ideas in Software Development: Revolution vs. Evolution. Part 1. Can in-house software programmers become extinct? customizable commercial and open-source software for conventional needs as accounting, CRM, CMS, etc. growth of domain specific languages and workbenches that allow business experts to build software. development of AI that can replace programmers, e.g. neural networks, expert systems, evolutionary computation. Lets imagine the worst scenario. Suppose the dark day came – somebody invented a machine that can program. Non-programmers can use the machine for building software for their business needs. Technical knowledge and programming skills are no longer needed – just tell machine what you want and get a software program. 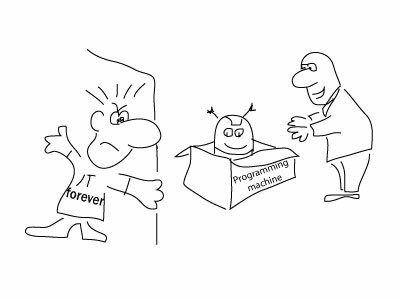 Will it be the end of in-house programmer’s era? What does business care about? The present programmers value for business is mostly in knowing what business don’t care about, but cannot avoid because of technical complexity and large amount of specialized expertise involved. But can programmers help with what business cares about? Can they offer something beyond technical expertise? Can they become key players for business? Communication with people is not easy. We have different backgrounds, knowledge, ways to think and present information. The major part of our knowledge is stored on the subconscious level, which is not easy to access, describe with words and share with other people. And often this is one of the biggest challenges in software development – correctly understand meaning of what people need. In many cases, customers don’t have clear understanding even themselves. Good solutions for complex and wicked problems are only possible with clear understanding of these problems. Programmers and customers can together define problems, explore needs and overcome gaps in understanding. Business will need programmers who help to discover meaning – true needs and real problems that should be solved by computers. Logical, rational and analytical mind is necessary for solving complex problems. Left brain is probably the most important part of a programmer’s body (at least for work). It could be used not only for programming, but also for resolving customer needs. Programmers should be able to convert complex business needs into clear, logical and consistent models and processes. They can remove contradictions, vagueness and gaps in the logic and concepts behind the system. Business will need programmers who can come up with straight and logical ideas for solving complex twisted problems. Software for people should be convenient, easy-to-use and simple. Good programmers understand how human mind works, the value of simplicity and beauty. 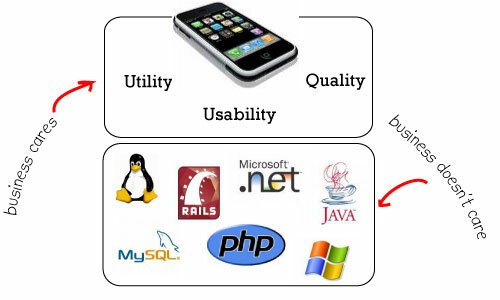 They can strike the balance between functionality, usability and quality of the system. They understand what is important or can be left out. They could make software users productive, successful and happy. Business will need programmers who can come up with friendly, elegant and simple software designs that empower people. People are more comfortable with other people than with machines. Programmers could connect, share feelings and support human customers in the process of creating a software system. They can work in playful way, motivate and open mind. They can engage customers, become good partners and merge into powerful motivated team for tackling any challenges. Business will need programmers who can make them comfortable, open minded and fully engaged in building software. The complexity of today world and huge amount of information overwhelm our brains. Many people are becoming narrow specialists who loose sight beyond the realm of their small professional world and job responsibilities. But good solutions require understanding of complex systems as a whole, how they fit into company business and outside world. Good programmers can understand this big picture, core concepts and relations. They know what is important, possible and makes sense. Business will need programmers who can comprehend big picture, have intellectual control over complex systems and offer intelligent solutions. as a result make system more complex and business more dependent. It works well now. Probably, developing 5 non-traditional non-technical aptitudes seems laughable, naive and wasteful. But this is the way to survive. Programmers should become key players for business. They should be involved in what business cares about. Learn how to see out of your box, project and profession. You can be more than a trivial technical programmer. Think about strengthening your positions as The New Programmer who mastered Meaning, Logic, Design, Empathy and Big Picture aptitudes. Can In-House Programming Compete With Outsourced Software Services? Programmers are lazy capricious pseudo-intellectuals. Really? 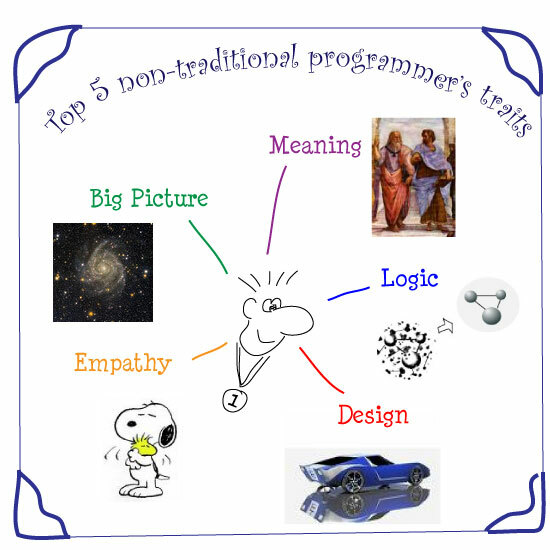 Five Big Personality Traits of a Programmer. Do They Matter? I am waiting for other articles about this topic, especially about how to better understand problems of business and how to master Meaning, Logic, Design, Empathy and Big Picture aptitudes.